Continuity is the most important feature of Finnish democracy in international comparison. The modern parliamentary system dates back to 1863 when the Diet of Finland with the four Estates started to convene. Democratic legislative procedures and the party system evolved, even though the Russian Emperor ultimately made the decisions autocratically. In 1907, the congress was replaced by a 200-seat unicameral parliament, with representatives elected in universal elections. In the first elections, 19 women MPs were elected. Since then, the parliament, almost unchanged, has remained the foundation of Finnish democracy. In 1362, Finns, living in the eastern provinces of Sweden, were granted the right to participate in the elections for the king of Sweden. The Finns would send a lawspeaker, priests and twelve peasants as their representatives to the Stones of Mora. From then on, the Finns participated in the Swedish parliament until the eastern provinces were annexed to Russia in 1809 and formed the autonomous Grand Duchy of Finland. The Diet of Porvoo, with four Estates, assembled once in 1809 but, after that, the Emperor did not call the Diet to convene for half a century. Finland enjoyed a high degree of autonomy and was governed by the Emperor’s decisions prepared by the Finnish civil service without the contribution of the Diet. In 1863, the Emperor of Russia and Grand Duke of Finland, Alexander II, summoned the Finnish legislative council to form a national assembly. The country was in need of several major reforms that required more statutory tax reserves for which the approval of the Estates was required. The Emperor opened the session of the four Estates on 18 September 1863 at the Imperial Palace in Helsinki, which later became independent Finland’s Presidential Palace. The four Estates were the nobility, clergy, burghers and peasants. Each of the Estates convened separately at the House of Nobility, which had been completed a year earlier. The legislative committees had representatives from all the Estates, and since Swedish was the official language of the assembly, interpreters’ services were required on a regular basis. Only a few of the representatives knew both Swedish and Finnish. The most important legal reform was the law on municipal sovereignty, which came into force in 1865 and separated the church and the secular administration, creating the foundation for the modern Finnish municipal democracy. The Estates convened at the Emperor’s invitation every three to six years for a few months to prepare legislation. The parliamentary procedures with Speakers and Committees evolved during this time and continued along the same lines during the unicameral parliament. Due to the Russo-Japanese war and internal pressures, the Emperor consented to political reforms that extended to Finland as well. In 1905, the liberal Swedish professor Leo Mechelin formed the first political government, or Senate, in Finland, which prepared a radical parliamentary reform. The Estates approved and the Emperor ratified the new parliamentary order in 1906. The Diet with the four Estates was replaced by a parliament to be elected with universal suffrage. Elections were to be carried out according to the D’Hondt proportional method, applied on a per constituency basis, so that seats in the parliament would be allocated approximately in proportion to the relative share of the votes received by each party. This same proportional electoral system is still in use in Finland both in parliamentary and local (municipal) elections. All persons of 24 years of age or older were eligible to vote. That included women as well, for the first time in the world. The first parliament had 19 women representatives from different parties. The political organisation began with language parties. The so-called Fennomans, who advocated for the rights of the Finnish-speaking majority, were the first to become organised. They eventually became the Finnish Party. As a legacy of the Swedish rule, the language of administration and education in Finland was Swedish, although only 15 per cent of the population spoke Swedish as their mother tongue in 1815. The Svecoman movement arose as a reaction to the Fennoman movement to defend the privileges of the Swedish-speaking population. The Svecoman movement later became the Swedish Party. The liberal and constitutional wing of the Finnish Party broke away from the party in the early 1900s and formed the Young Finnish Party. Constitutionalism involved more resolute resistance to Russification measures and stressed the sacrosanctity of the laws, whereas the Finnish Party believed in a more pragmatic negotiating strategy to protect the position of the Finnish language. Later, a group called the Agrarian League split from the Young Finnish Party to promote the interests of the agrarian population. The Workers’ Movement evolved into the Social Democratic Party in 1899. It became the largest party in the unicameral parliament with 80 seats out of 200 in the 1907 elections. The SDP split up when the Communist Party of Finland (SKP) was founded in Moscow in 1918 after the failed rebellion. The SKP was banned from the 1920s to the 1940s but once allowed again after the Second World War it became a major political force until the late 1980s. In 1918, the Finnish Party and the Young Finnish Party became, respectively, the National Coalition Party (Kokoomus) and National Progressive Party (Kansallinen edistyspuolue). The former continues today, but the latter, after many name changes, has disappeared from the Finnish political scene. The Finnish party system is very stable: although the parties periodically break up into factions, the only truly new party is the Green League born in the 1980s. In 1865, the church and secular administration were separated. At the municipal meeting, the right to vote was tied to taxation: one income tax unit corresponded to one vote. However, no one person could have more than 1/6 of all votes. Women controlling their own property also had the right to vote. In 1873, the right to vote in towns was tied to taxation. Two years later, sovereign unmarried women were given the right to vote, but were not eligible for election. Local democracy progressed, even with restrictions in electoral rights. In 1917, the government passed a law on universal and equal suffrage and eligibility at the local level, i.e. at municipal elections. The first elections were held in December 1918. Unlike in national government politics, there is no government vs. opposition at the municipal level. All parties elected to councils will be allocated a share of executive board and committee seats that corresponds to their number of councillors. After the socialist revolution of 1918 and the ensuing civil war, municipal democracy was a major factor uniting the divided nation. The integration process was further reinforced by the general compulsory education, which allowed all children to go to school regardless of the family’s social standing. 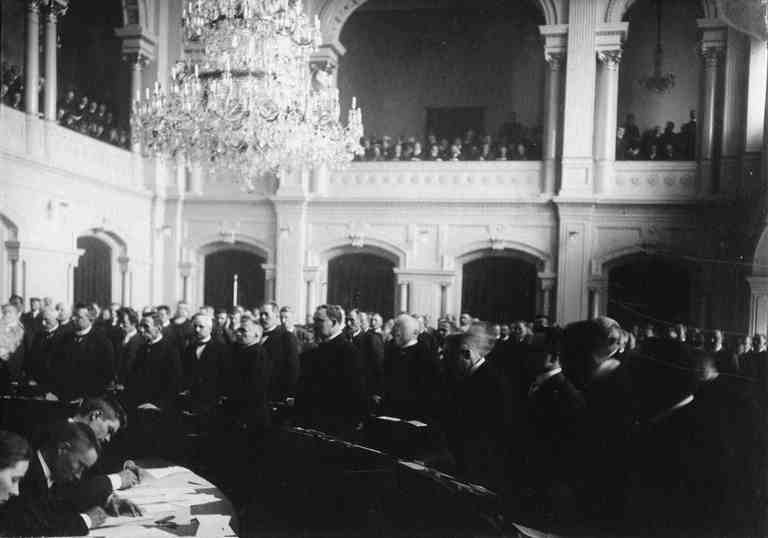 At first, the Emperor dissolved the unicameral parliament every year, as Speaker P. E. Svinhufvud considered the Russification measures illegal and took the view that the Emperor had not kept his promise to respect the constitutional laws of Finland. Svinhufvud was deported to Siberia in November 1914. He returned as a national hero at the end of March 1917, was elected Chairman of the Senate, or Prime Minister, in November 1917 and the first head of state of independent Finland in May 1918. After Svinhufvud, Oskari Tokoi was elected Speaker of the Parliament in 1913. He was the first socialist to hold the post. In March 1917, Tokoi became the first socialist Prime Minister in the world. A year later, he participated in the rebel government that attempted a coup, fled to Soviet Russia and then to the United States and returned to Finland only in the 1950s. Results of parliamentary elections (200 seats). The peasantry had up to 64 members. They were elected by an electorate elected by the municipal assemblies on a per judicial district basis. The bourgeoisie had up to 75 members. All towns elected representatives. Sixteen representatives were elected from Helsinki. The clergy had up to 48 representatives. The members were bishops and representatives elected by priests, universities and grammar school teachers. Each noble family was represented in the nobility by the head of the family. At its peak there were 203 representatives.